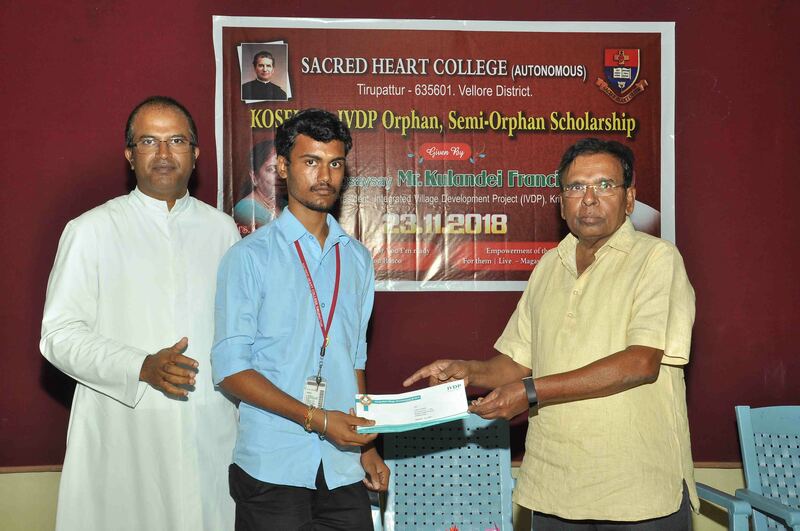 IVDP Kosaley Memorial Scholarship for Orphans and Semi-Orphans of Sacred Heart College (Autonomous), Tirupattur – 635601, Tamil Nadu for the year 2018-19 was distributed to 150 students on 23.11.2018 at BISW hall. 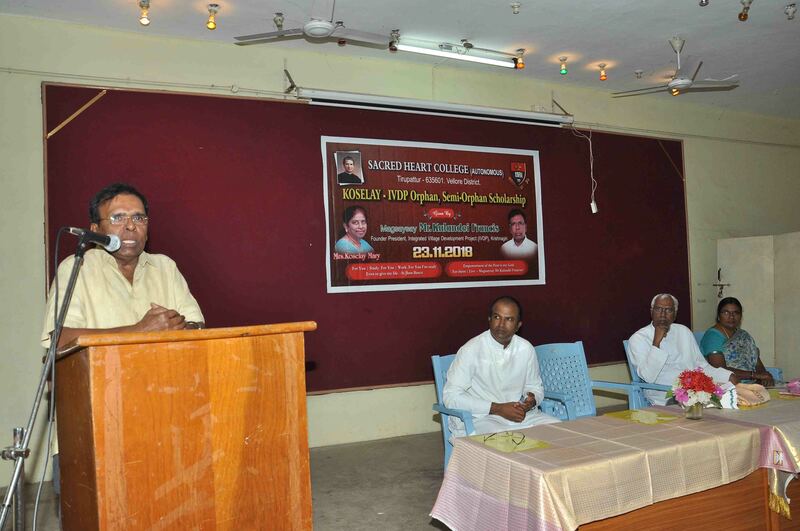 Magsaysay Mr.Kulandai Francis was felicitated by Rev.Dr.Antonyraj, the Rector and Secretary, Rev.Dr.Maria Antony, Principal, thanked the benefactor for his generosity. Fr.S.Henry Daniel Ambrose, Director of DEEDS, welcomed everyone and coordinated the scholarship process along with Mrs.Tharageswari. 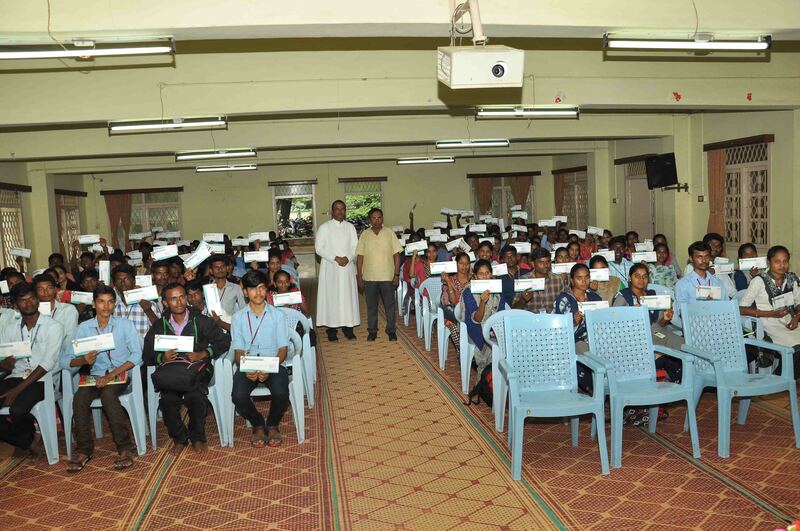 Mr.Kulandai Francis after handing over the cheque to the individual students (Total of Rs.7,75,000) – encouraged them to study well and become persons of integrity where your prayer and action becomes ONE. The heart-warming event came to end with students spontaneously coming forward and thanking sir. One girl said “from today Mr.Kulandei Francis is my inspiration for generosity”. Long live Mr.Kulandei Francis and the works of IVDP.